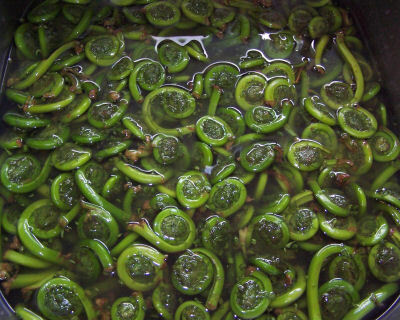 I was born in Maine, and one of my fondest memories is the collection of fiddlehead ferns each spring. Even though I have moved away, each year my family boxes up a whole bushel of them and sends them to me by priority mail here in NC. It’s always a special day when that box arrives! 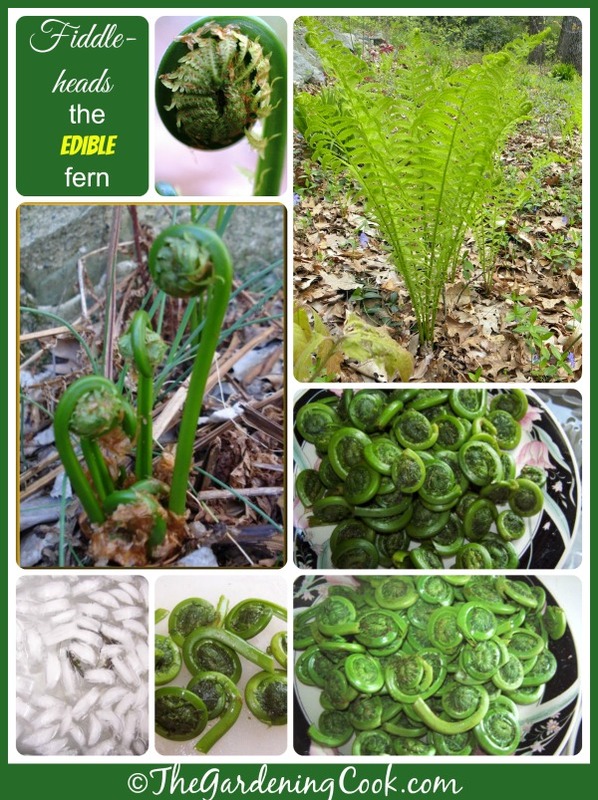 Did you know these edible ferns are a perennial that you can grow in your own garden? 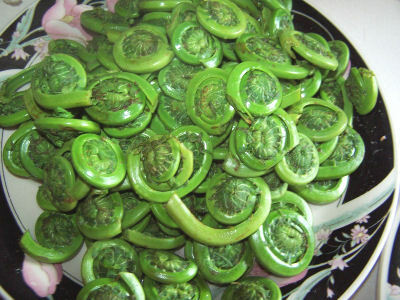 Although fiddleheads are available in supermarkets in some parts of the country (the northern areas particularly), they are not a commonly cultivated plant that is readily available. 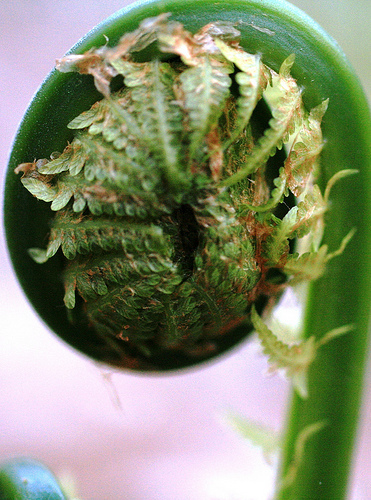 Fiddlehead ferns are the furled fronds of a young fern before it had opened up. They look like this before you clean them. 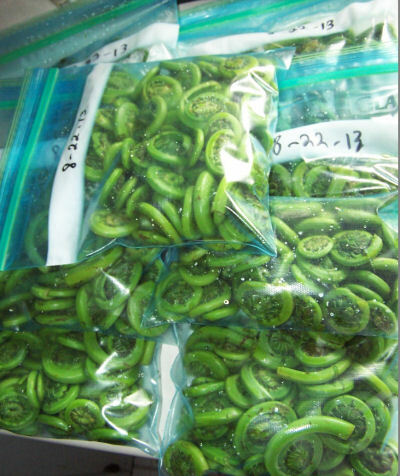 In rural areas, such as Maine, fiddleheads are harvested by individuals each spring. It is customary to choose about half of the fronds on a plant. Although the plant will produce 7 or more fronds, over picking the fronds will kill the plant. So three is a good number to pick if the plant has 6 or more fronds. I live in North Carolina now, but my mother and father know how much I love these delightful green fronds, so they send me a box of them every spring. I got such a box today. 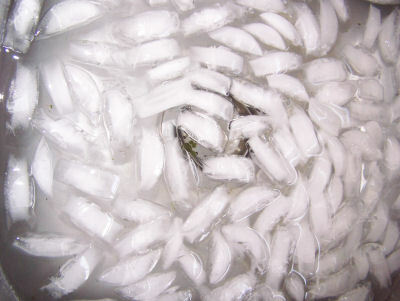 For the last couple of hours, I have been preparing them for freezing. This is the process…. The ferns arrived in two large bags in a priority mail box. I put water in my sink and just dumped them into the water. I have a two tub sink, so I filled both tubs with water, moved them back and forth between the two tubs, draining the water and refilling it each time. It took about 6 rinses to get them relatively clean. These are clean enough. You will know when the sink drains go from the top photo to the bottom. 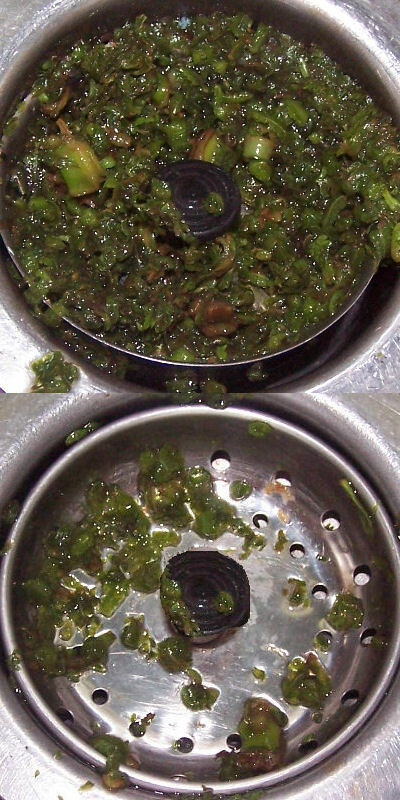 The frond has a lot of material in it and rinsing is the way to get rid of it. Don’t skip this process, as tedious as it is. Next, I put a large pot of water on the stove to boil and filled the sink with clean water and added a lot of ice cubes. I trimmed the ends off of the fronds and waited for the water to boil. I worked in small batches. As soon as the water boiled, I dumped in a plate full about this size. I set the timer for two minutes so the fiddleheads would blanch and not boil. When the two minutes were up, I took them out of the pot of boiling water and dumped them into the ice bath to stop them cooking. The color of the blanched fronds is lighter than those before boiling. I kept doing this…cleaning, blanching, cooling until they were all done. This is what I got for my batch this spring. 7 quart size bags. I’ll ration them well. I hate it when I use up the last bag! Here is a YouTube video from the University of Maine which discusses identifying and harvesting fiddleheads. The flavor of fiddle heads is hard to describe. I think it is similar to okra, but others have described it as a nutty sort of asparagus flavor. 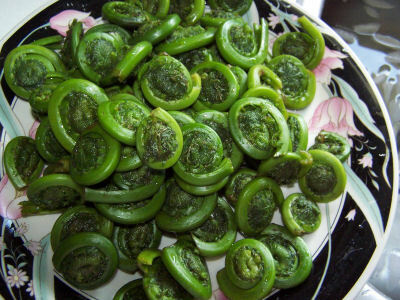 The flavor of fiddleheads goes well with cheeses, tomato sauce and oriental cuisine. Excellent with Hollandaise sauce. I love them just cooked with butter. 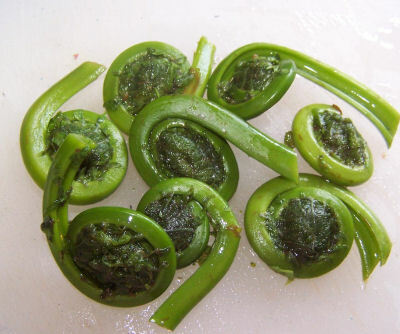 Fiddlehead ferns are a good source of vitamins A and C. They should not be served raw as they have a slight bitterness until cooked and could cause stomach upset if eaten raw in quantity. If you live in a southern area and want to try growing your own, Ostrich ferns are a good choice. Oh how I CAN NOT WAIT for in just a few weeks, these sweet spring treats will be up! 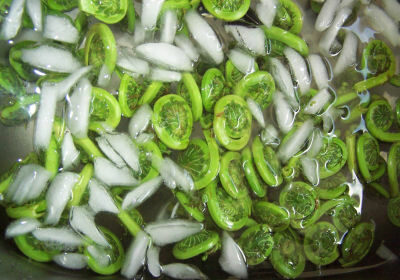 I plan to freeze several quarts of fiddleheads. The snow is QUICKLY melting here in mid Maine! One oddity I noticed in your pictures…Fiddleheads come up in spring, but your bags are labeled August..what’s up with that? LOL. I have no idea why they say that. Must have been a senior moment on the day. I remember mum sent them to me in spring and I cleaned them right away. too funny! What is this plant called ? Picked in Bay Roberts . The bulb is peeled and eaten . It looks similar to a tiny banana.